Meet the weird, wacky teachers who started it all in this special paper-over-board edition, which includes the first four books in the wildly popular series: Miss Daisy Is Crazy!, Mr. Klutz Is Nuts!, Mrs. Roopy Is Loopy!, and Ms. Hannah Is Bananas! Join A.J. and the Ella Mentry School gang as they face one crazy teacher who can’t add or subtract, another who collects garbage, and a principal who hangs upside down from the flagpole! Could second grade be any weirder? 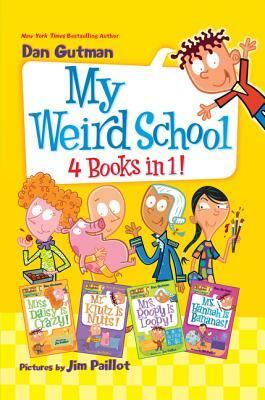 Perfect for reluctant readers and word lovers alike, Dan Gutman’s hugely popular My Weird School series has something for everyone.